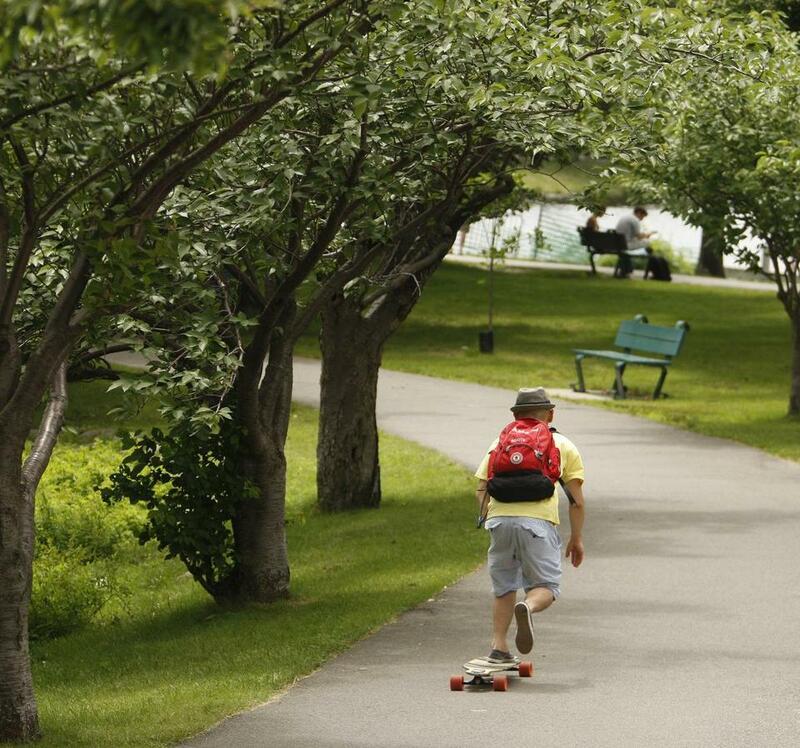 A man rides his skateboard at the Charles River Esplanade last summer. IF BOSTONIANS of a century ago hadn’t been open to grand plans, the Charles River Esplanade, one of the city’s greatest amenities, might never have been built. So when the Esplanade Association recently put forth an ambitious vision for upgrading the riverside park and removing much of the transportation infrastructure that has encroached on it, the proposal was a welcome reminder that Boston’s future vibrancy depends on thinking big now. The state and the city should embrace the plan’s goals by launching a thorough assessment of how the association’s proposed changes to Storrow Drive would alter traffic flow throughout the city. The plan comes at a time when the state’s roadway and public-transit infrastructure is creaking under enormous debts, and making good on the Esplanade blueprint means dealing with the associated transportation issues in a cost-effective way. The Esplanade plan envisions some major new landmarks, such as a giant Ferris wheel along the Charles River Dam and a grand new entrance to the Esplanade, near where the Arthur Fiedler Footbridge now stands, that better connects the riverside park to the Public Garden. Yet even more noteworthy is what the plan would remove: By taking away some existing traffic lanes and rededicating that land to park uses, the plan would turn Storrow Drive, now a de facto expressway, into a parkway more like Memorial Drive in Cambridge. The plan also calls for removing overpasses that connect Storrow Drive to the Fenway area, and for simplifying the complicated roadway system at the foot of the Longfellow Bridge. Advocates of this approach argue that Storrow Drive will soon reach the end of its expected life, and that the state, which owns the roadway and the park, should consider other options besides simply renovating the status quo. Yet while the changes advocates envision would be spectacular for park users, it’s crucial to acknowledge the real transportation issues that this change would involve. Storrow Drive now carries upwards of 100,000 vehicles a day. Much of this traffic moves between Interstate 93 and one of the region’s key economic engines, the Longwood Medical Area. The Esplanade 2020 report suggests that much of this traffic should go instead along the Massachusetts Turnpike. But the Pike has capacity limits of its own, and funneling traffic to the toll road from Storrow Drive would require additional highway ramps in an already crowded corridor of Boston. There are some simple, easily achievable parts to the Esplanade Association’s plans - repairs here, better signage there. The more dazzling improvements in the Esplanade 2020 plan will pay greater rewards, but will require a diligent planning process and a long-term commitment from the community as a whole. Bostonians will have to want it dearly - and get organizing now.